Naki'o was just a puppy when he was found in the icy cellar of an abandoned home. "His mom was dead in the house. He was the only one that was frozen into a puddle," said Christie Pace, a veterinarian assistant. Naki'o lost his paws and the tip of his tail to frostbite. Homeless, injured and struggling to walk, he was just the kind of dog Pace was looking for. "I have a soft spot for rescue animals in general. I was looking for something different, unique. I wanted to make more of a difference than a regular dog. I knew I could help him out," she said. But she didn't know how until she saw a dog in a knee brace at her clinic. That sparked an idea: she raised the money to pay for prosthetics for Naki'o's two rear legs. Then the maker of the artificial legs offered to make two more for free - for Naki'o's front legs. "When we saw how good he was doing with his back leg prosthetics and how he was struggling to use his front legs it was very simple to say, 'we gotta keep with him.' He could do much better with all four prosthetics on," said Martin Kaufmann, owner of Ortho Pets, a Denver company that specializes in pet prosthetics. And the doctor knew how to tackle it. "I think we can help provide Naki'o a more comfortable life and longer more comfortable life," said Patsy Mich, a veterinarian with Ortho Pets. Naki'o can now play fetch to his heart's content and enjoy his newfound mobility. Kaufmann said Naki'o's only challenge would be learning once again what the ground feels like to walk on -- and he has no doubt Naki'o's playful spirit will help him adjust to his new paws. "We get to work with patients with drive and determination," he said. "They have a real willingness to thrive." Other veterinarians are amazed by the technology. "Pretty groundbreaking that's it's all four and I find that bigger animals will be using them as well, so it's all very exciting," said Veterinarian Deirdre Chiaramonte. In recent years, veterinarian medicine has advanced by leaps – with not just braces and prosthetics, but also implants - metal rods fused to the animals' own bone and then attached to an artificial paw. 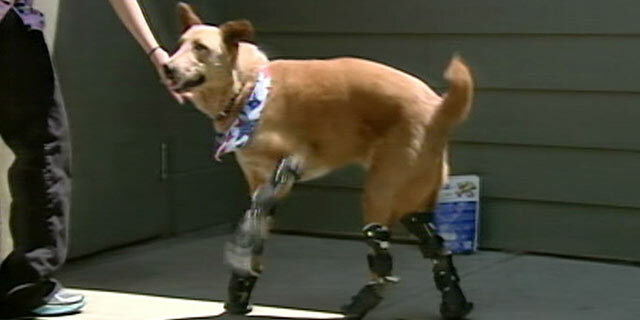 Veterinarian Marty Becker said prosthetics are becoming increasingly common on disabled pets. One prosthetic can cost anywhere form $1,000 to $3,000. "It's really heartwarming," said Becker. "Dogs just soldier on. They could be in incredible pain but still greet you with their tail wagging. Just a few weeks ago, a Siberian husky named Zeus got the first front leg implant at North Carolina State University's veterinary school.